Despite using the same Rag recombinase machinery expressed in both lymphocyte lineages, V(D)J recombination of immunoglobulins only occurs in B cells and T cell receptor recombination is confined to T cells. This vital segregation of recombination targets is governed by the coordinated efforts of several epigenetic mechanisms that control both the general chromatin accessibility of these loci to the Rag recombinase, and the movement and synapsis of distal gene segments in these enormous multigene AgR loci, in a lineage and developmental stage-specific manner. These mechanisms operate both locally at individual gene segments and AgR domains, and globally over large distances in the nucleus. Here we will discuss the roles of several epigenetic components that regulate V(D)J recombination of the immunoglobulin heavy chain locus in B cells, both in the context of the locus itself, and of its 3D nuclear organization, focusing in particular on non-coding RNA transcription. We will also speculate about how several newly described epigenetic mechanisms might impact on AgR regulation. 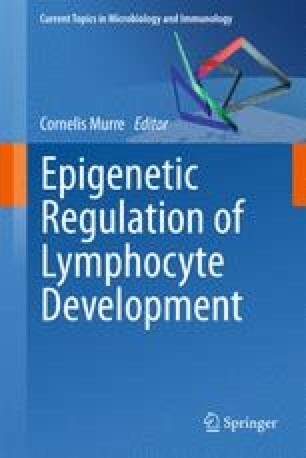 The authors thank all members of the Corcoran group and the Chromatin and Gene Expression Laboratory for helpful discussions. The Biotechnology and Biological Sciences Research Council, UK supported this work.